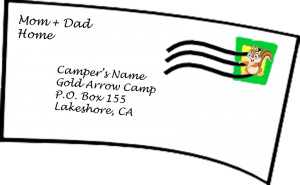 While at Gold Arrow Camp, campers are permitted to receive letters and postcards that can be sent with ONE FIRST CLASS STAMP. Oversized envelopes and packages, which require more than one first class stamp, will not be accepted. Campers are not allowed to receive any packages while at camp. Please make sure to let your relatives and friends know not to send your child a package while at camp, but encourage them to send letters and postcards which can be sent with one first class stamp. 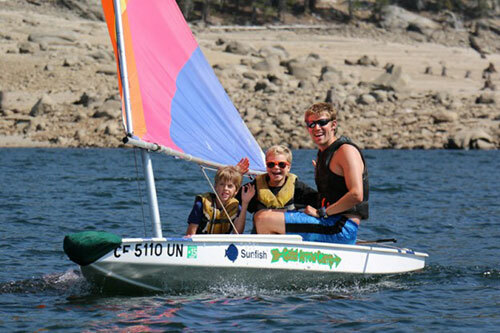 If there is a clothing or equipment item (e.g., prescription glasses, a school-assigned reading book, or a toiletry item not available in the camp store) that you need to get to your child while they are at camp, you must contact the camp office, let us know what you are sending, and address the package to the office; the item will then be unpacked and delivered to your camper. If you do not call and get the package pre-approved, it will be returned to sender, unopened. We will no longer be storing undeliverable packages. Campers traveling by air may ship luggage via UPS ahead of their camp stay. Why do we have a “No Package” Policy? We have determined that packages lead to unnecessary stress for our camp parents and campers. 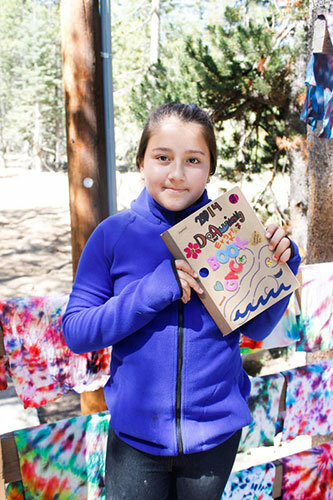 Some camp parents have, in the past, felt obligated to send their child one (or more) packages, so that their child does not feel left out or be the only one who does not receive a package. Other parents have opted to send large packages with items for every child in the cabin. In both cases, the items received in packages have created large volumes of trash, have often ended up un-opened and un-used (since our camp schedule is busy), and have made it difficult for our campers when packing to return home (because of limited room in their luggage). Packages have also often led to hurt feelings for campers who don’t receive them. Because of our setting (in the heart of the Sierra National Forest), we do not allow food, candy, or gum in our cabins or out in camp. “Grandma’s Cookies” have never been allowed at GAC. In the past, many parents utilized professional package companies who sent expensive, pre-packaged games and other items. As mentioned above, one of the main outcomes of these packages was a mountain of cardboard and other trash. Campers are busy at camp and don’t need additional games or items.